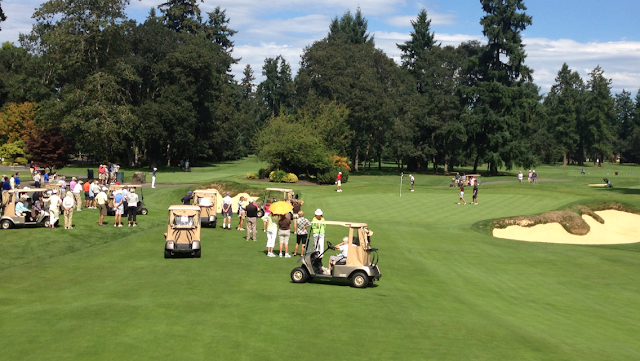 Here's the scene Monday during the Club Championship finals. It was a gorgeous afternoon and the greens were rolling over 13 on the stimp. Above you see the men going at it on #11. Congratulations to Andrew Howeiler for winning that 36 hole match and becoming the Club's newest champion golfer. Just moments prior however, the most exciting finish most of us have ever seen occurred on the final hole of the women's final match. Above you see our very own Pat Harbottle get up and down from our "hell bunker" on 18 to win the hole and the match. She had an extremely fast putt from off the green which just dropped in on it's last turn. The crowd erupted and at age 80, Pat took home her 22nd Club Championship Medal. Congratulations Pat. Also, congratulations to Frank Mitchell for winning his match and taking home his 6th Senior Championship medal. We really have some awesome players at the Club, and the newly renovated course made for some exciting matches with great theater for us spectators. But how good is your memory? 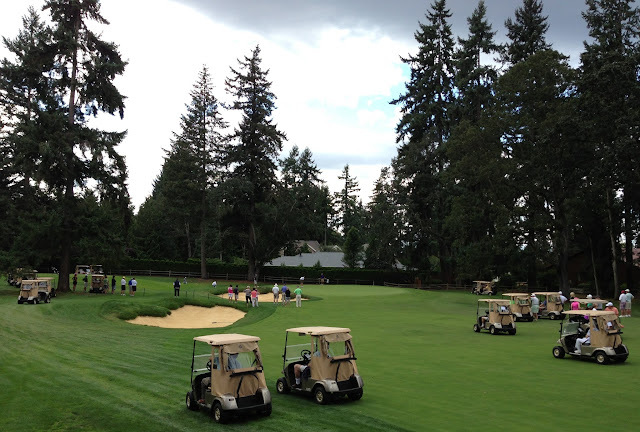 Do you remember what the course was like a year ago? Now that it's been raining cats and dogs yesterday and today, it's fun to look back because we can really appreciate the renovation now. Check this out. 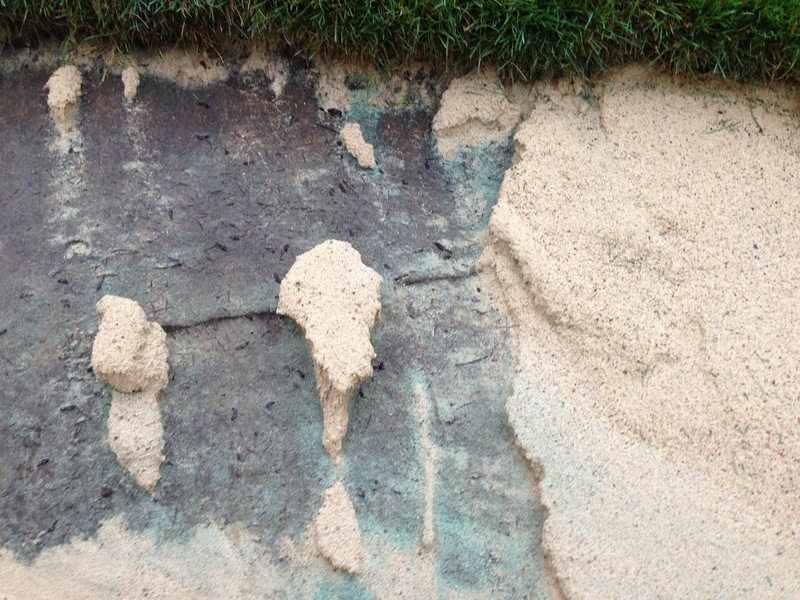 Look how badly the old bunkers were performing in their final days. 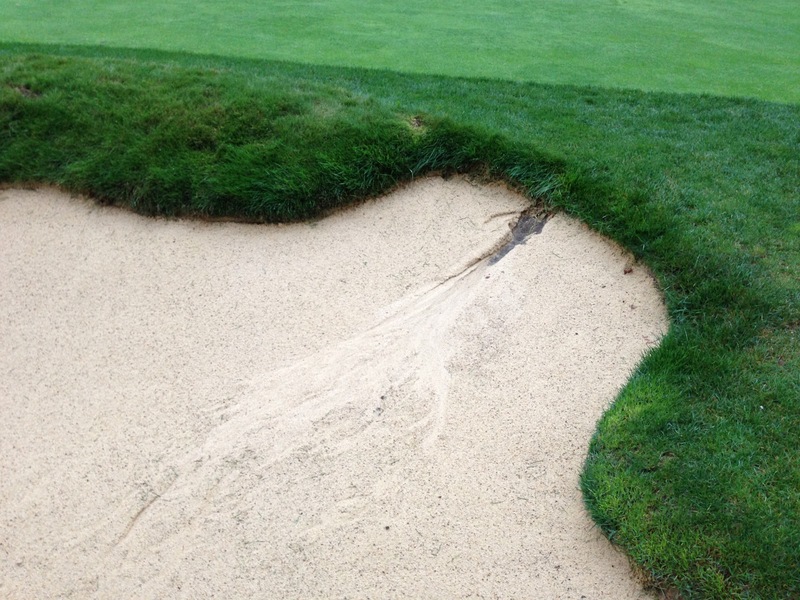 Very poor drainage and where the sand was washed out, exposed rocks and dirt mixed in with the bunker sand which just made things even worse. So in the past 24 hours we have received over 2" of rain. This is our first real test of the performance of our new bunkers. Here is how things looked when we came in this morning. 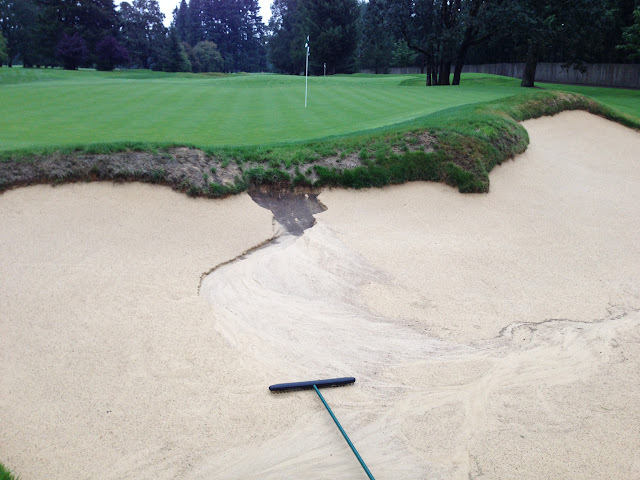 One little washout on #17. 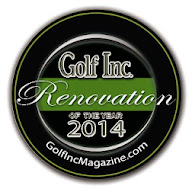 No big deal at all, especially since we installed sod liners during construction. Notice how there is no exposed rocks and the bunker sand is still clean and free of sediment. you can see some of the blue/green marker dye we used in the spray that was applied to the liner before the sand was installed. I'm facinated that some of this stuff would still be visible. 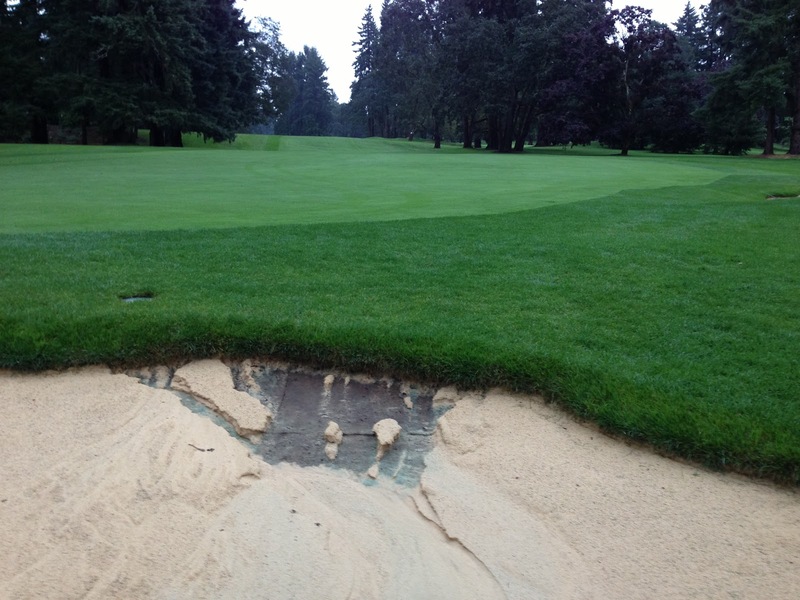 Definately goes to show that we have not received a lot of rain since finishing the renovation. Now here's a really interesting wash out that we have actually been expecting. Watch this video for a good look at this bunker and a close up of the sod liner. Seriously, the new bunkers not only look amazing, they perform beautifully. The sand has settled in and achieved a good level of firmness, the maintenance of the fescue eyebrows has been manageable, and the drainage has worked beautifully. Look back at some of the blogs during the renovation to see some details of the constructions process. 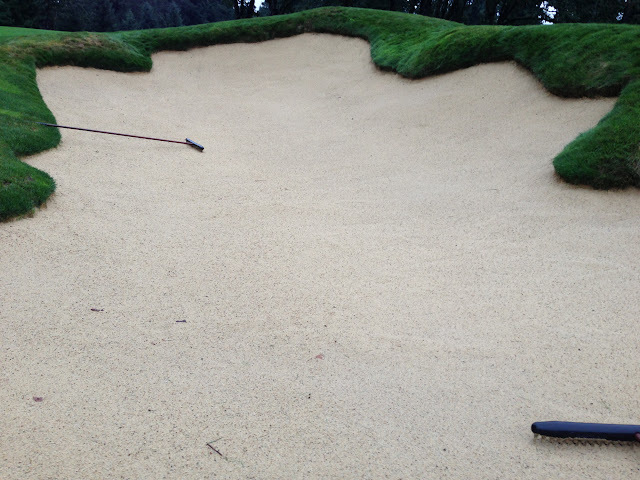 One great thing about having bunkers with good sand and drainage is how they look right after a good rain. Look at how smooth and firm this bunker is. Absolutely no maintenance is required for this to play well. Last year at this time we would have to spend many man hours power raking the sand just to loosen it enough to play out of. During the winter months, the new bunkers will play well with very little input needed by my staff which means you get great golf conditions and we can spend time doing more productive things. You gotta love it when a plan comes together.